The new International Ocean Discovery Program is poised for an exciting decade of revealing the secrets of the Earth beneath the sea. The deep riser-drilling vessel Chikyu is a keystone of this endeavor, providing the global community with the capability to reach targets inaccessible by any other scientific platform. On behalf of the CHIKYU+10 Steering Committee, I invite you to help plan Chikyu's explorations for the next decade and beyond. I look forward to seeing you in Tokyo in April. Decadal planning for the deep sea drilling vessel Chikyu of the Japan Agency for Marine-Earth Science and Technology (JAMSTEC) is commencing. Chikyu, a unique resource for science, will continue to recover deep samples and conduct in situ monitoring beneath the world's oceans for the International Ocean Discovery Program (IODP) beginning in October 2013. 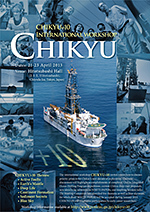 The international workshop CHIKYU+10 invites researchers to discuss priority projects for Chikyu's next decade of exploration. The workshop will be held 21-23 April 2013 in Tokyo, assisted by IODP Management International. Thematic discussions will highlight accomplishments of completed Chikyu Integrated Ocean Drilling Program expeditions, current Chikyu deep riser proposals, new ideas to be submitted as white papers, and inspiring keynote talks. The Steering Committee has identified five thematic as well as blue sky areas, for which short white papers will be accepted during January 2013. Travel support for the workshop is under discussion by JAMSTEC, and other national and consortium IODP sponsors. Registration, applications for funding and submission of white papers will open on 7 January 2013. CHIKYU+10 will emphasize participation by early career researchers. The final workshop agenda will be published by 1 March 2013. Seismogenic zones pose lethal hazards to humans and civilization through seismic shaking, deformation, and tsunamis. Chikyu will help scientists understand the mechanisms that control fault behavior by sampling and monitoring conditions in the crustal earthquake zone. The largest part of Earth's interior, the mantle, lies within reach of Chikyu. Direct observations will fundamentally change our understanding of early Earth, present-day mantle dynamics, and evolution of the ocean crust, with wider implications for our solar system. The mostly unmapped microbial ecosystem beneath the seafloor is a new frontier of biology. Deep sampling will revolutionize our concept of life: its origins and co-evolution with the physical Earth, its diversity, its adaptation to extreme environments, and its depth limits. How Earth's continental and oceanic crust became differentiated, and how continents originated through time can be studied by deep drilling at island arcs, oceanic plateaus, and magmatic divergent continental margins where continental crust is forming today. Drilling deep sections of marine sediments will explore past ocean environments, reveal changes in large-scale oceanic, atmospheric, and continental conditions, and illuminate the effects of cataclysmic events such as episodic flood magmatism and bolide impacts. Individuals and research groups are strongly encouraged to suggest other science areas for exploration by Chikyu's deep riser drilling capability.